A packet of tortilla chips has been lying in my grocery storage for the last 1 month.. and craving for attention. I have just been putting it off site thinking not today … One fine evening , I was thinking of a starter before Pasta .Then remembered about this recipe which is an ideal medley.. and something tat’s quite fresh n healthy.This mexican side is quite an ideal combi with tortilla chips. Cover with a cling film and refrigerate for at least 1 hour in order to blend all flavors . 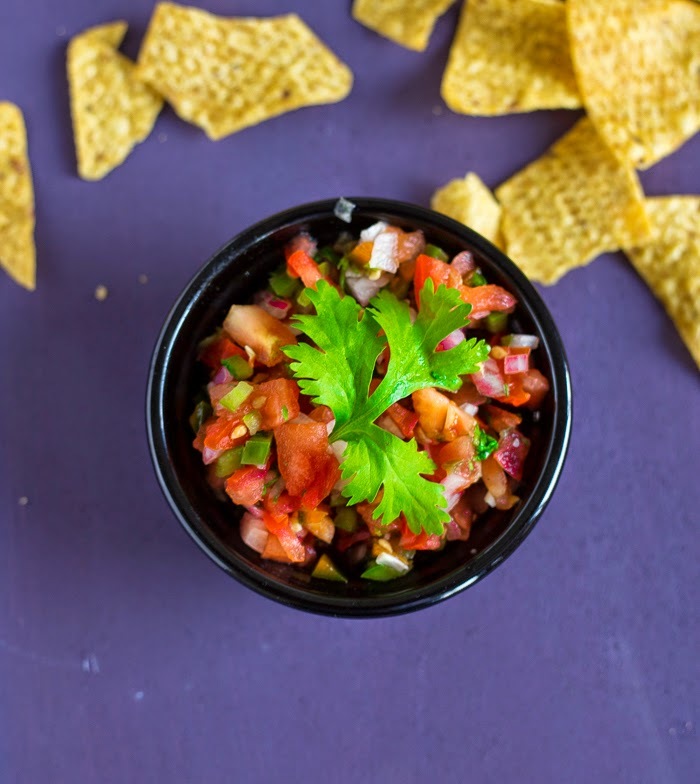 To enjoy a healthy starter just serve the tortilla chips with Salsa. For a cheesy time :Spread the tortillas over the plate . Sprinke the tomato salsa over it .Followed by chopped jalapenos , sliced onions and grated cheese. Microwave it until the cheese melts and then enjoy it cheesy. Make sure to chop the vegetables as fine as possible. Hummm Yumm salsa..I guess everybody loves it..isnt it? Thinking of salsa takes one to the Italian ones and their spices. This is different specially the chopped coriander. I shall try it on roasted PapaD. Great Presentation. I'm sure it tastes equally good. Loved your salsa!It is such a coincidence that we ate Mexican and we were thinking of making salsa at home..
Hmm—Yum yum tomato salsa my daughter's very favourite. salsa looks so nice! !….superb presentation, sandhya! Looks awesome da….very nice presentation! Yummy tomato salsa and a beautiful picture. The salsa looks so yummy. Nice presentation dear..
Thats a healthy deal! Great presentation.. I liked your blog very much. I appreciate for your wonderful presentation and tomato salsa looks delicious. You are welcome in my blogs. wow… yummy salsa, looks delicious. I am mouthwatering now, seriously!! Wow yummy salsa.never tried at home.nice presentation. Salsa seems a perfect idea to finish those tortillos:) Lovely recipe dear. Lovely flower! very tasty salsa. Thanks for sweet words in my blog. Your blog have very healthy recipes. I am following you! Salsa is new to me.Will try your recipe Sandya.Thanks for dropping by my blog.